Many enjoy the sounds of a wood burning fire and crackling. Now you can get that experience in your fireplace with the Real Fyre Crackler with Wood Chunk Cover. It will sound like a real wood burning fire coming from this speaker encased in a natural-looking large piece of wood. With a low, medium, and high setting, you can have as much or as little popping and crackling with just the push of a button. Enhance the sounds of your fire with this ingenious product from Real Fyre. What is the size of this log? The wood chunk cover for this Real Fyre Crackler is about 5 1/2" tall, 4" wide and 2 1/2" deep. The crackler itself is housed within this wood cover. What are the dimensions of the chunk cover? This chunk cover is approximately 6" in diameter and 4" tall. Can this be run remotely? 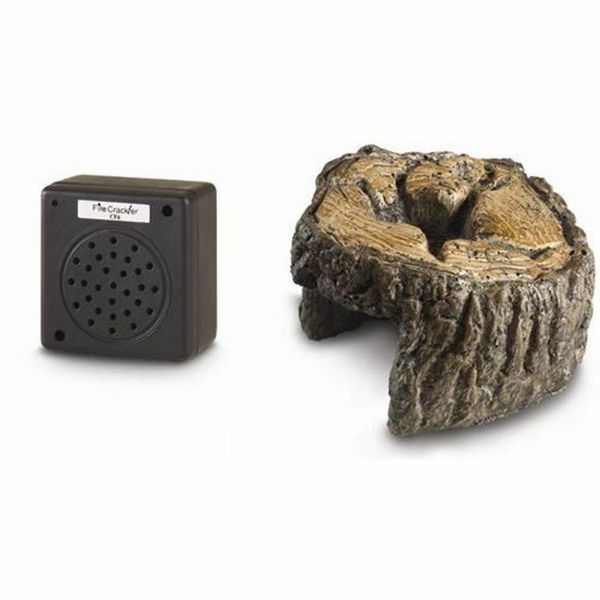 This wood crackler has a built-in push button that must be turned on and off at the unit; there is no option for remote control. Does this need be installed somehow? You can simply place this item on your hearth, as it is battery-operated and completely cordless. I set the crackler up and it did make semi authentic wood fire sounds but the loud popping was somewhat annoying and didn't really sound like it was coming from the fireplace. Could be my room acoustics or the device itself but I decided to return it. ProsThe design and the idea. ConsSound effect was not authentic in my opinion.